Danze Sirius Modern Wall Mount Brushed Nickel Toilet Brush Holder: This Danze Sirius Modern Wall Mount Toilet Brush Holder is built to last. The highest quality standards are used to precision manufacturer a top of the line fixture. Important features of this 100% BRAND NEW Fixture: Complete Item! Everything necessary for installation is included. Brushed Nickel Modern Square Toilet Brush Holder - Toilet Brush Sirius Collection Wall Mount - The Sirius wall mount toilet brush is constructed with a frosted glass holder and metal brush handle. This product is equipped with synthetic bristles that will leave the inside of your toilet spotless. - Firmly installed at desired height along wall - Concealed mounting offers a seamless appearance - Brushed Nickel premier finish designed to resist fading and tarnishing. - Design matches Sirius collection - All metal construction will provide sturdy support - Matching Accessories Available - Easy to Install - Installation instructions included. This fixture is manufactured by Danze and is part of their Sirius Collection. 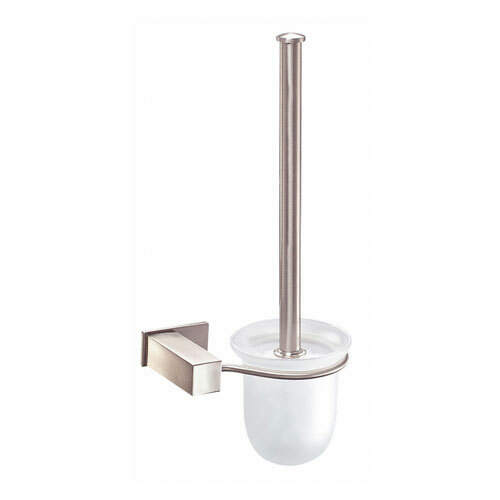 The Sirius wall mount toilet brush is constructed with a frosted glass holder and metal brush handle. This product is equipped with synthetic bristles that will leave the inside of your toilet spotless.